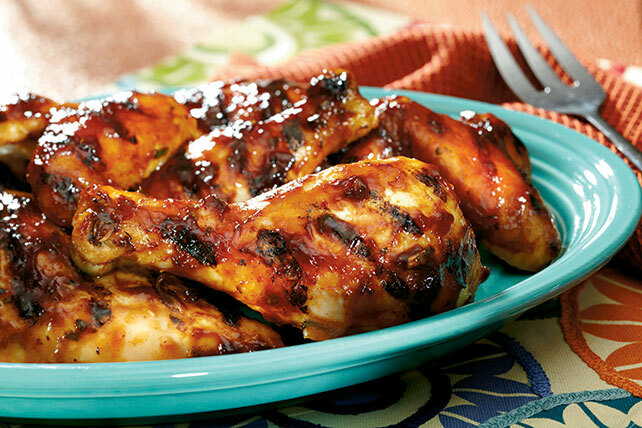 Make barbecued chicken like you've never seen it before! With garlic, seasoning and lemon juice, our Barbecued Chicken ups the flavor on classic chicken. Trim and discard excess fat from chicken. Mix barbecue sauce with remaining ingredients. Grill chicken 10 min. on each side. Brush with half the barbecue sauce; grill 10 min. or until chicken is done (165ºF), turning and brushing occasionally with remaining sauce. Serve with smart sides such as a steamed vegetable and plain baked potato. Prepare using your favorite KRAFT or BULL's-EYE Barbecue Sauce.